Sydney is Australia's main financial, commercial and industrial city and is home to many major corporations, international companies, business headquarters and impressive office blocks. The Central Business District (CBD) is split into two separate areas - the southern section starts at Circular Quay and continues towards King Street, with the northern half being located in North Sydney. 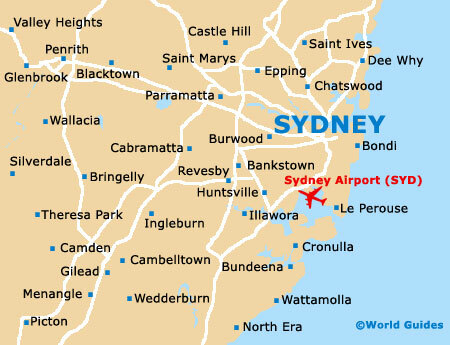 Home to an excellent travel network, including Sydney's harbour and airport - the busiest airport in Australia, the city is also an important transport hub which contributes greatly to its wealth and popularity. Sydney has many world-class business facilities, meeting rooms and conference complexes throughout the centre, all with excellent business facilities, including state-of-the art communications technology. 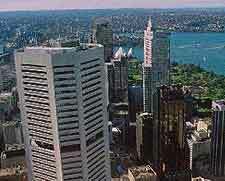 Tourism, retail, hospitality and the vast campus of Sydney University also make up a large part of the thriving economy. 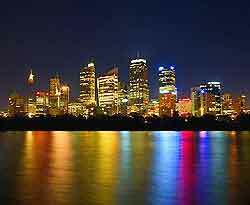 As a result, there is an enormous range of world-class shops and restaurants, many of which are clustered around neighbourhoods such as Chippendale, Darlinghurst, Haymarket, Pyrmont, Redfern, The Rocks and Ultimo. 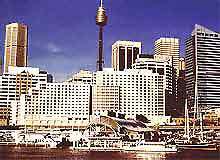 There are a large number of historic tourist attractions and landmarks in and around Sydney city centre, often with exceptional views of the harbourfront, with the Opera House certainly standing out in particular. The Sydney Convention and Exhibition Centre, in the Central Business District, has superb business, conference, convention and exhibition facilities. The centre is home to many of the city's most important and prestigious festivals, events and concerts. Most offices and businesses in the city of Sydney are open on weekdays between 09:00 to 17:30, and most banks operate from 09:30 to 16:30 Monday to Thursday and remain open until at least 17:00 on Fridays. Many of the largest banking branches open between 08:00 to 18:00 during the week. There are numerous ATM cashpoint machines located throughout the city of Sydney, providing travellers from abroad with a useful way to exchange currency, where required. Sydney's shops open from around 08:00 or 08:30 until 17:00 or 17:30 on weekdays and many shops have extended opening hours on Thursdays, staying open until 20:00 or 21:00. Shops in Sydney usually open all day on Saturday and although some do close on Sunday, many open in the city centre, particularly along the major thoroughfare that is Oxford Street. Working lunches are an especially popular way to do business in the city of Sydney and locals are quick to use first-name terms when appropriate. Notable local dining venues are to be found around Haymarket, The Rocks and Potts Point in particular, as well as Woolloomooloo, Dawes Point and McMahons Point, amongst other areas. Currency in Sydney and Australia as a whole is decimal, with the Australian dollar as the basic unit of currency. One Australian dollar has 100 cents and the notes come in $100, $50, $20, $10 and $5 denominations. Coins come in 5c, 10c, 20c, 50c, $1 and $2 amounts and transactions involving 1, 2, 3, 4, 6, 7, 8 or 9 cents are either rounded up or down to the nearest multiple of 5 cents. A brief and friendly handshake is usually the customary greeting in Sydney and generally throughout Australia. It is acceptable to address new acquaintances on first name terms and businessmen here are usually very friendly. Sydney's restaurants and cafés operate a strict 'no smoking' policy, although some may cater for smokers in different open-air spaces. Offices and businesses in Sydney are also 'non-smoking' and many Australians are strongly anti-smoking. As a rule, it is best to only smoke when in the company of like-minded people.